I’ve been marinating on this little ditty, this little nugget of truth since I saw it on pinterest a couple of weeks ago. You see it is all very good and well to read these words and to believe them. It is another thing to actually live them out. 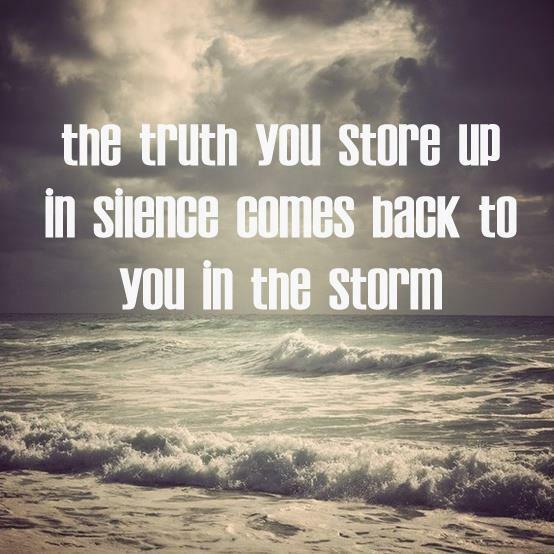 And gee……there is absolutely no denying the truth of these words when you see someone living it out…..when the truth they have stored up in the silence is the only thing that gives them hope, it helps them carry on, sees them through the hard times, when the storms come. This past week I’ve had the honour to walk alongside a friend as she has encountered one of life’s curveballs. You know that mixture of feelings you get when you go for your big anatomical ultrasound scan, when you’re about 20 – 22 weeks pregnant? You’re thrilled to actually see this little person for the first time, you may or may not be eager to know the baby’s gender, but you also have that slight uneasiness..hoping everything is ok with that baby. Wanting a good report for everything. Well Lindsay didn’t get that all clear that we all hope for, not then anyway, and she has another wait of a few more weeks before she gets definitive results from more tests done this week. You can read this part of her story here, and she writes it beautifully, so much better than I ever could. I said it is an honour to walk alongside her through this and I truly mean that. I can see the fruit and the evidence of what Lindsay and her husband build up in the silence, carrying them through the uncertainty. Giving them hope and that peace that passes understanding. You see it is not that Lindsay and CJ are perfect – nope – they are human, just like the rest of us – it is because they serve a perfect Lord. They are conduits of the Holy Spirit – vessels – that’s all. I like to think of ‘the truth that we build up in the silence’ as being the things we build our lifeboats out of. Lifeboats to keep us afloat when our ships are capsized by life and life’s curveballs. * The word of God = the body of the boat, the hull. Knowing God’s word means knowing God, knowing his heart, and who wouldn’t want to know the creator of the world’s heart? In Ephesians 6 Paul talks about the armour of God and of putting on the sword of the spirit, which is the word of God. The bible illuminates, it reveals to us the good and the bad, it gives clarity to the wise and the unwise. The sword, the bible, is used for offensive and defensive purposes. Jesus used the bible to counter Satan’s attacks when in the wilderness. The word of God deep down in our souls is going to keep us afloat when storms come. We can depend on God’s word and the promises in his word. * Prayer = the gps/ radio in your lifeboat. The prayers that you pray in the silence come back to you in the storm, when you don’t have the words to say, when you can only muster up that Holy moan. An utterance. Prayer is just communication with the Lord and the *best* thing about prayer to me, is it keeps your perspective right, it keeps you looking up and out so that you’re not consumed by your here and now. No relationship survives without communication, including our relationship with the Lord. Prayer – communication is necessary for growth and intimacy. You know this past week the easy thing for Lindsay to do would have been to hide away. To just hibernate with her husband while working through the emotions and seeking a Godly perspective in all the waiting. But in doing that she would have been denying her friends the opportunity to reach out to her, to uphold her family in prayer and the opportunity to partake in a miracle. The harder thing for her was to share with people where she was at – and God was glorified. She could call on these friendships because they have been established in the silence. When life was a little easier. And then, when the storm came, the outboard engine of friendship helped to push her along a little….reassuring her…. Now here’s the scoop, the latest on Lindsay’s baby, Charlie. Lindsay’s OB (who also happened to be my amazing OB, a great man of God) emailed her today with the news that the fact that the ultrasound that Lindsay had yesterday showed no abnormalities in the baby’s heart, that it was normal, was a gift from God. The ultrasound yesterday was so different from the bizarre one from the previous week shows that the baby was healed. This was not a technical glitch, but a healing. Praise God. Praise Him. And here’s the thing – because Lindsay chose to include others in her journey, both in her real life and through her writing, others have been blessed. My own faith has been boosted. What my husband and I prayed for, in the quiet of our time with the Lord, has been heard. Countless others have likewise stood in faith with her about this too and prayed for healing – they have been touched and who is glorified? Not Lindsay, not CJ, even though they are strong leaders and amazing people in their own right. No, the Lord is glorified in this healing of baby Charlie, because the Lord is the reason for their peace and their very purpose. Lindsay and CJ still have a few question marks hovering over their little Charlie’s life – but nothing can take away from the fact that this life is God-ordained, this life has a purpose, this life already has an amazing testimony of God’s healing power and this life is loved. Loved by the people around him already, but even more so by the one who created him. Whatever the next weeks or indeed the years to come bring my dear friends, they will be riding out the storms just fine. They have a lifeboat. They are building their lifeboat……prayer by prayer, bible verse by bible verse, friend by friend, they are building their boat. All of us will encounter storms in our lives, it is not a matter of if, but of when……when will you need your lifeboat to hold you afloat until your seas become smoother? And will that lifeboat be ready for when you need it? ← For the ‘my child is the worst’ parent….